Here is Mark's UV curing rig. Mark is using Curall 365 lamps to cure wood (the prototypes for it, actually), and chose to start with a single ballast and 6 lamps, in 32w mode using our Workhorse 8 ballast, similar to my first rig. This would be a budget curing rig, but fine for hobbyists and part time luthiers. He added some extra reflective material, and shows some serious skills in making the cabinet both light weight and attractive. It has two lamps on the back, one on each side and one on each door panel. 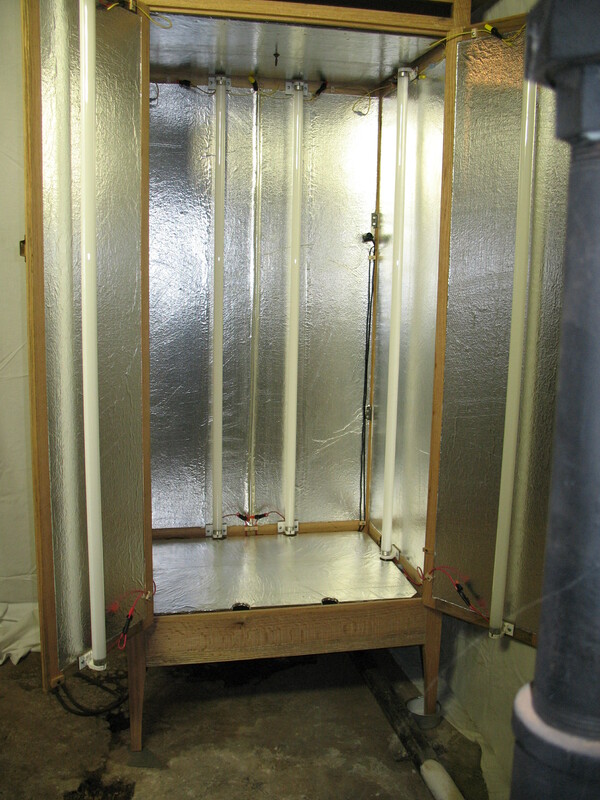 He even used screen in the bottom to allow the system to vent using natural convection while filtering out dust and a small squirrel cage fan below (shown in electrical image). He also went the extra step of using a union block for the electrical, which I think is a professional way to do it, although not strictly necessary. I also see a small relay that is being used for switching, which isn't required but is a very professional touch. Judging from the photos, the inside of the box is around 4 foot long, just slightly longer than the lamps. 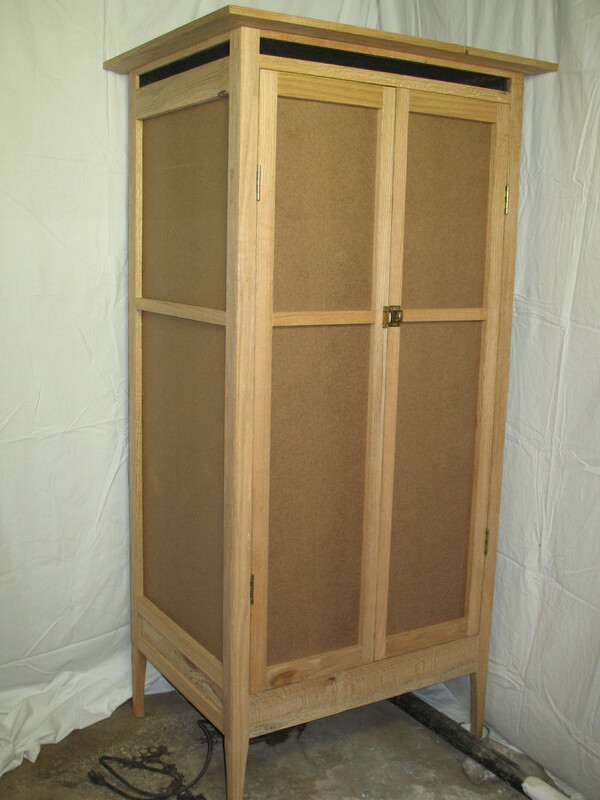 Here is Mark's description: This UV cabinet is designed for violins and violas, to tan the raw wood and dry oil varnish. The first picture is of the outside of the cabinet. The dark openings around the top are for ventilation. They are screened with a fine black cloth mesh, probably meant for Halloween costumes and that sort of thing. The second picture is of the interior of the cabinet, showing lamp placement, the foil lining, and some construction details. The cabinet can be disassembled for moving or storage. Its top lifts off. The foil-covered ceiling and floor sit loosely on wooden frames, and can be removed relatively easily. There is about 3/4 inch of clearance around both to allow air circulation. 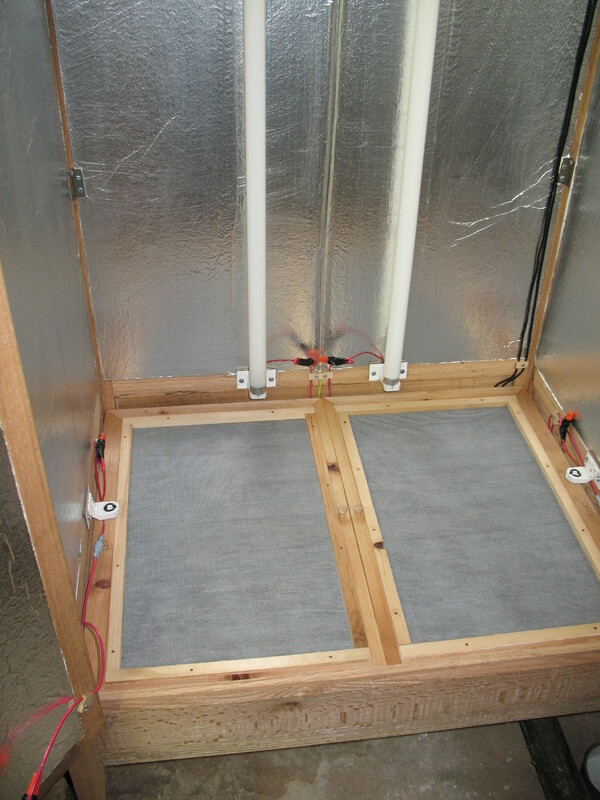 Below the foil-covered floor is an improvised air filter, shown in the third picture. This is made of the light paper liner from inside a vacuum cleaner bag, sandwiched between two pieces of nylon window screen material. The filter is in two pieces and sits loosely in a frame at the bottom of the cabinet. It is easily removed, giving access to the real floor of the cabinet where most of the electrical stuff is mounted. 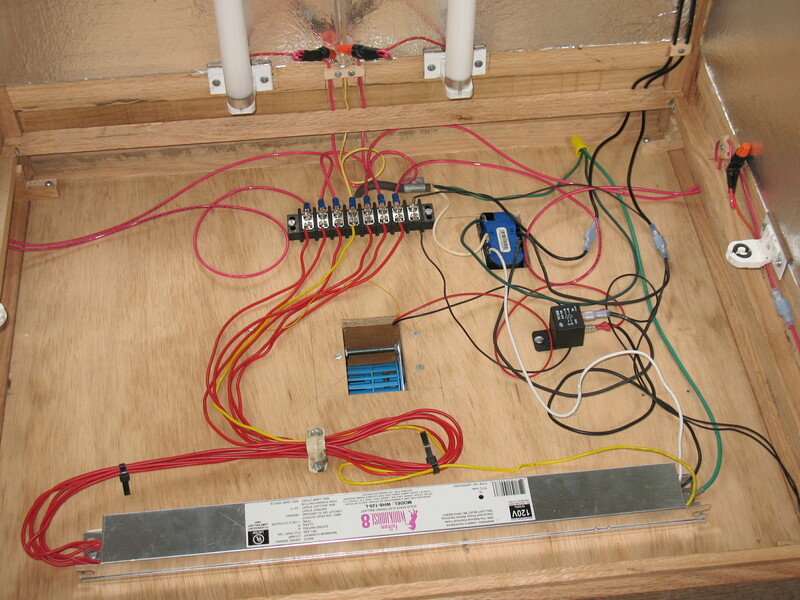 The fourth picture shows that the cabinet floor is an electrical panel. Again, the cabinet is designed to come apart, so the floor, with all of its wires and electrical gear, can be detached from the four large side panels of the cabinet. The floor is held securely in place by four wooden "L"s that press against the underside of the filter frame. The black connector strip in the back allows the lamp wires to be disconnected from the floor panel. The blue wire connectors allow wires that run between panels to be disconnected. Three pairs can be seen in this photo: two on the black wires leading to the main power switch (out of the picture), and one on the red wire on the far right which leads to one of the two door-mounted lamps on the front panel. Small wooden blocks hold the wires securely in place; three can be seen clearly in this picture, two near the wire nuts on the back and side panel, and one holding the two black wires that lead to the main power switch. The wire nuts are unfortunate. The 14 gauge wire available at the hardware store was too large for the lamp mounts. For those I used some 18 gauge stranded wire salvaged from an old appliance. The stranded wire, once the stripped ends were tinned, could be used in the lamp mounts and then spliced onto the heavier 14 gauge wire as seen. If I were to do this again I would probably try to use 18 gauge stranded wire throughout. Stranded wire was desirable, in any case, at the two doors to allow them to open and close easily. The cabinet is ventilated by a salvaged computer fan. It remains to be seen whether this fan is strong enough to push air through the filters and into the cabinet. This happens to be a 12 DCV squirrel-cage style fan, found at the dump. It is powered by an old answering machine transformer plugged into a household electrical outlet, whose blue back can be seen with wires connecting to the main electrical cord (salvaged from an old electric typewriter), the ballast, the ground wires, and the main switch. An automotive relay can also be seen. The two thin wires running out of the lower right side of the photo carry 12 VDC (from the fan) to a micro switch mounted behind the right-hand door. The switch operates the relay, cutting 120 VAC power to the ballast when the door is open. The four main cabinet panels, front, rear, and two sides, are held in place by dowel pegs, and eight steel brackets made from an old bed frame. (Two can be seen clearly in the third picture.) After the top, ceiling, and floors are removed, and the wire connectors separated, each side panel may be released by loosening four screws and lifting the panel upward off of its brackets. It's a nuisance, but it works. What I love about this build is that it is so very, very elegant, yet included part from the dump. There is poetry in that, and speaks to his resourcefulness and willingness to recycle perfectly good old items into this rig. All and all, an impressive effort, both in the quality of the workmanship, as well as making the system effective yet simple. If he wants to bump the lamps up to 45 watts, or go from 6 to 12 or 18 lamps, this system will scale very easily. This is a perfect example of a simple UV curing rig taken to a professional level of detail, with good old fashioned creativity and skill. I'm sure it will evolve over time, and he will continue to improve it. Great job Mark! Click on any image to open up a new window with a much larger, close up view. You can then zoom in with your mouse for even better resolution.